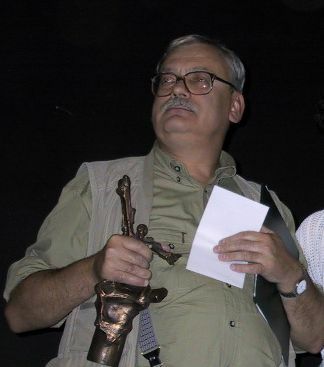 Image: “Sapkowski” by Szymon Sokół is licensed under CC BY-SA 3.0. Fantasy books have garnered mainstream popularity ever since the groundbreaking “Lord of The Rings” trilogy was written by J.R.R. Tolkien and have since spawned a new generation of fantasy works like George R.R. Martin’s “A Song of Ice and Fire,” J.K. Rowling’s “Harry Potter” and Terry Pratchett’s “Discworld,” just to name a few. Within the past few years, one book series has gathered a significant cult following: “The Witcher” by Andrzej Sapkowski. Popularized by three highly successful video games adaptations, the series is now being adapted into a Netflix series that will star British actor Henry Cavill as the main protagonist. The first book in the series begins with “The Last Wish,” which introduces the series protagonist: Geralt of Rivia—a professional Witcher. In the world of “The Witcher,” Witchers are mutated humans who act as professional monster hunters and chase down and slay all manner of beasts that prey on humans such as werewolves, vampires and wraiths–all for the right price. “The Last Wish,” along with its sequel, “Sword of Destiny,” is broken up into short stories which detail Geralt’s many dangerous contracts. What makes “The Last Wish” unique is that its plot structure uses one of the stories, “The Voice of Reason,” as a framing device. Meanwhile, the other stories occur as Geralt remembering his various jobs while he recovers in a hospital after a fight with a striga, a female werewolf. “The Last Wish” is also striking in that each chapter is written as a cynical deconstruction of the various tropes we have all come to expect in most fairy tales or fantasy books, not unlike “A Song of Ice and Fire.” Looking for a tale involving medieval knights? Then expect most of them to be ruthless killers, sons of nobles who take offense to every tiny slight or occasionally, a gentleman. A story involving feudal lords at a wedding party? Then expect them all to be professional brown-nosers, warmongers bragging about the battles that they won or monarchs who are way too used to getting their way on everything. This is not to say that the writing is perfect however, since every author has his or her flaws. Most of the time Sapkowski doesn’t try to do any kind of worldbuilding whatsoever or explain how Geralt’s travels relate to his overall story, how exactly Geralt’s various elixirs and magic work or how he learned how to do them. If that lack of explanation really bothers you, then I wouldn’t recommend the book to you. That being said, “The Last Wish” is still a great read for bookworms interested in something different from Tolkien, Martin or Pratchett that is able to breath new life into the fantasy genre while also taking the time to give a serious deconstruction to the various tropes and cliches we have come to expect from the dozens of fantasy novels that have come before or after it.